The other day I was trying to kill forty five minutes in a coffee shop and figured I'd just sip some coffee and maybe get some reading done. Instead I ran into a kind fellow named Richie who apparently spends a lot of time at this particular cafe and an older woman in an electric wheelchair named Sherry. Mine and Richie's conversation turned from a chat about the Olympics to a half hour plus conversation between all three of us about the gospel. Surprisingly, I wasn't even the one who brought it up. Neither of these two were believers, but Sherry launched into a story about her frustration with her daughter's and son-in-law's newfound born again Christian faith, because it meant that they would no longer spend time with her. Sherry framed this in terms of their opposition to her use of medical marijuana, which she employs because at 71 years old and with arthritis everywhere in her body, it's the only thing, she says, that makes her feel any better. So the two of them began to voice their frustration with those narrow-minded born-again's and their belief in a God who would be so cruel as to punish sinners. "One God, One Love" was Richie's self-proclaimed motto, while Sherry, apparently feeling more biblical, went with "God is Love." The question became, "How could a good God eternally torture people just because they don't believe in him?" Well I have no intention to answer that question right now, except to say that I don't think you'll find it in annihiliationism. The conversation turned out pretty good even after I interjected that I myself am one of those narrow-minded born-again's who believes in the Bible and its narrow-minded God. What really stood out to me was how indignant these two folks were about the idea that God would torment regular, nice folks like them just because they didn't happen to believe in Him. Put another way, they don't believe in sin. Thus my response throughout our conversation was focused often on convincing them that there really is a problem with the world, and that problem is sin. The next step then is to agree with the famous G. K. Chesterton quip: the problem with the world is me. And you. And everyone else. I admit that God's justice towards sinners can be hard to swallow, but at my best that is because I recognize how unjust it would be for me to exercise God's justice. I am the one who deserves it. If only people would reflect enough to realize just how unfriendly the world is, then maybe sin would be an easier thing to say. The fourth angel poured out his bowl on the sun, and the sun was allowed to scorch people with fire. They were seared by the intense heat and they cursed the name of God, who had control over these plagues, but they refused to repent and glorify him. The fifth angel poured out his bowl on the throne of the beast, and its kingdom was plunged into darkness. People gnawed their tongues in agony and cursed the God of heaven because of their pains and their sores, but they refused to repent of what they had done. So who wants to tackle the medical marijuana question? It is legal in California, under certain situations, and I know of Christians who say that their use of it is helping them. Yes, Christians. Real ones. If we oppose believers smoking to alleviate pain or depression, on what basis (since it can be legal now)? If we affirm it, how come? Or is "don't ask, don't tell" the best policy? I think the problem with this couple isn't the "weed", but the stumbling block created by the born again christians. Jesus Christ should be the stumbling block, but so many times it is the christians misunderstandings that are the greater stumbling block. They never get so far as to be confronted with Christ because we are arguing the peripherals. About marijuana, I consider it the same as any drug or substance. It has a purpose profitable to man. Excessive use is bad as is with any substance. Alcohol, prescribed meds, fried food, or anything commonly ingested for food or pleasure can good or bad. Scripture deals with this issue by first telling Peter that all animals are clean or good to eat because God has provided them and also we are not under the Law. It also states that all things are good in moderation. If there are cultural differences or preferences the Christian should allow those differences so that they will not be a stumbling block to the unbeliever or believer. The children of the couple you mention have alienated themselves over a preference of the lifestyle that the parents have. If they have a hang up because of Christ than it is a different story. So in my opinion marijuana is ok, and the kids don't help parents by pushing them away. Thanks for weighing in, Nate. I'm surprised there haven't been others. This is a subject most of us are far more likely to confront than polygamy but look at all the play it got on the blog! I'm going to confess a bias against Christians using pot. Part of this is pure stigma -- pot has largely been stigmatized by our culture, especially up to my generation (I'm middle aged). This seems to be giving way, but I don't know if that's a good thing. The other thing is I have a built-in bias against Christians getting high for its own sake on any substance including "legal" ones like alcohol, etc. "Sober-mindedness" is a an attitude we are exhorted to adopt in Scripture. But how can we be high and soberminded at the same time? Still, I recognize that we give ourselves over to many pleasures and entertainments that are not necessarily spiritually valuable all the time. Finally, I have a built-in conviction that a person is more spiritually mature if they don't use pot than if they do -- but I'm not speaking in terms of truly mendicinal use, but recreational. 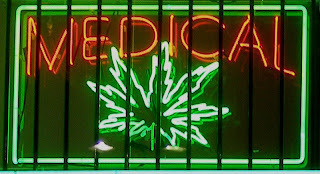 Still, from what I know about med marijuana, the line between the two can be hard to discern in many cases since the prescription threshhold seems to be highly subjective and flexible. But I'm not presenting these points as arguements. I'm simply reporting my natural starting places when I think on this topic. I trust that is what Nate is doing, too, because if his citations of Peter, etc. are arguements, they're not very strong. I have a question then, how would you respond to burn victims, labor and delivery mothers, bone breaks, or other major medical issues? Drugs used for these purposes are purified and refined versions of many of the "street" drugs. What of even the more grayer areas such as ADD or depression? As we get closer to the recreational uses where is the line? The easy answer is to say whatever the doctor prescribes is ok, but we see even when prescribed some argue they are still not necessary. I have friends that won't even use use drugs when the woman is in labor which is absurd. I asked them if God doesn't believe in pain relievers then why did He put Adam into a deep sleep before He took his rib? Yeah, that's the question: where is the line? My wife was on oxycontin - a time released narcotic for some time after a terrific car accident and it scared me. However, her goal was to wean off of it asap and she did. So, I'm all for pain relievers but we're not talking recreational or "mind-expanding" use here. You ask about ADD and depression. That's closer to the bone. If pot "helps" people with such things, is it a legitimate "treatment" or just a way to cover over something? Is the cannabis user looking for a way to wean off as symptoms improve? These are all things that matter to the discussion, in my view.